In my grandmother's attic I found a quilt quite neglected and sad. My grandmother has always been a woman of needles, knitting and crochet, but not much for sewing. 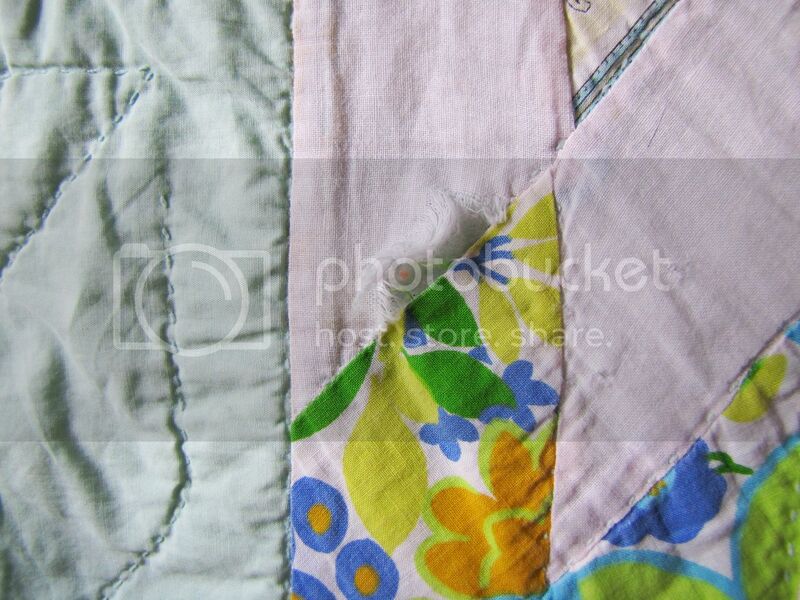 This quilt, my grandmother supposes, just might of been made by her sister, Adelaine. That would be Aunt Adelaine, she of the many, many buttons, which now occupy a dozen jars in rainbow of colours on a bookshelf in my main room. 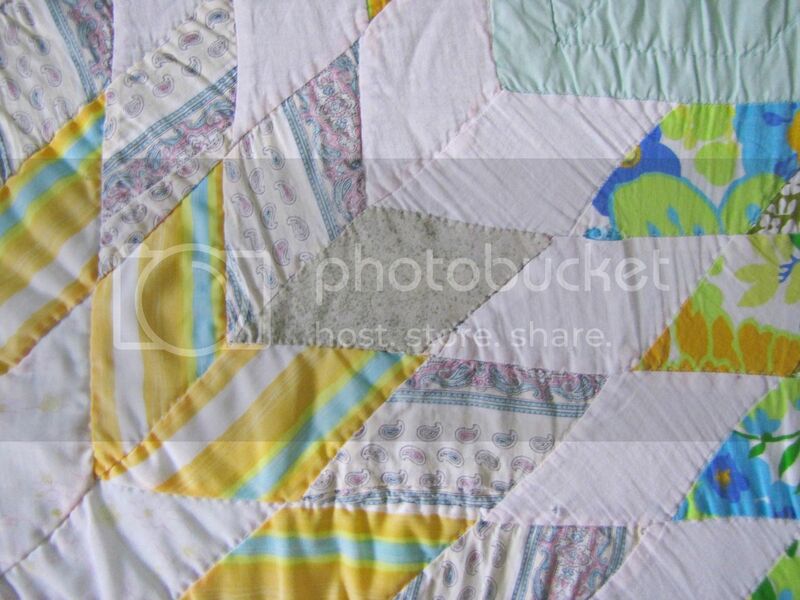 This sad attic quilt has several torn patches and the edge has completely come off. The worst damage, though, is some rust staining along one of the edges. I had a serious debate with myself about whether or not I should take it down from the attic and see if I can restore it or just carefully fold it back up and leave it where it was. In the end I decided it should come home with me while I figured out how to revive it. I have appliqued a couple patches on now and started to put on new binding. The rust stains, after much elbow grease and application of various cleaners, will not come out. 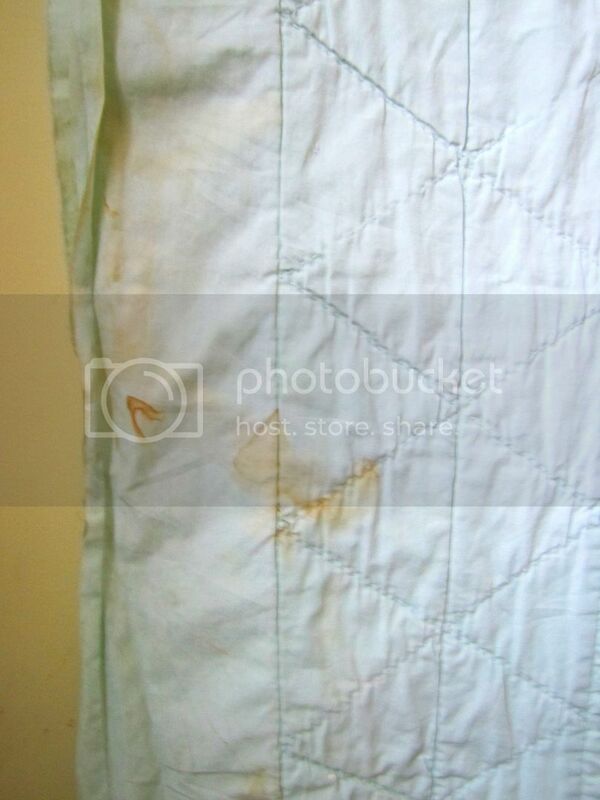 I'm afraid I will just have to embrace the stains as wabi sabi and move on. Hopefully this week I will be able to finish the repairs and show you the whole quilt. I think you'll agree it is worth a bit of patching and sewing to bring back to life. Before I can continue, however, there is a special event. Birdie's fifth birthday is tomorrow and he was allowed to plan our family menu for the day. The big decision is whether to have the chocolate cake with the lemon frosting for breakfast or have the lemon cake with chocolate frosting instead? Ah, decisions. Being five years old is hard. Before I go, don't forget to drop back a post and check out the free peasant blouse pattern download available only until Friday evening. What a treasure to find in the attic! Can't wait to see it done.